Your lovely yoga teacher has the whole class in a standing forward fold and says, "now, roll up to standing, vertebrae by vertebrae, with grace and ease." Have you followed these instructions and tried it? If you are a teacher, have you taught this? I used to do and teach this too. However, I don’t anymore because doing this led to me hurting myself (more on that later). Now, as a yoga therapist, I don’t teach this because it's not a functional movement. What do I mean by functional movements? Functional movement involves moving in a way that is based on your real-world movement needs. This may include walking up the stairs, taking out the trash, getting down on the floor to play with our kids or grandkids (and then picking them up), driving to yoga, or reaching to the top shelf to get the salsa and chips. This list may seem silly to some, but if you have ever been limited by any of these, or know anyone that has, you understand how important such activities can be for independence, empowerment, and engagement in the world. Some yoga moves may have made their way from the dance or sports world, with no intention of conditioning our bodies and minds for practical needs of living in the world. One of the best examples of this is the common cue of rolling up to standing from a standing forward fold. This probably made its way from dance-trained yoga teachers. If you have a healthy back with no pain, arthritis, or disc issues, this may be fine (although I still don’t recommend it). However, it is a high risk pose for much of the population with the potential to cause a sudden injury like a herniated disc or intense spasm. It is not functional and, in many ways, does not encourage long-term back health. We have probably all been told that when we pick up something heavy, we should bend from the knees and hips and not round into the back. I believe that our yoga practice should reinforce—not conflict with—such recommendations, which are developed from an understanding of biomechanics and how the body functions. I used to practice rolling up to standing in yoga classes because, hey, it feels graceful and the teacher said it was good for me. However, it clearly conditioned me to have poor body mechanics. Once, I bent over to pick up the trash, pulled a muscle, and had a back spasm that dropped me to the floor. It took weeks to fully recover. I had never had anything like this happen to me and I realized it was because of the way I was neurologically programing my movement patterns in yoga class. What we practice in yoga is indeed powerful. Now, after learning my lesson the hard way, I teach and practice coming up from a standing forward fold by hinging from the hips with an engaged core, long spine, and a (at least) slightly flexed knees. 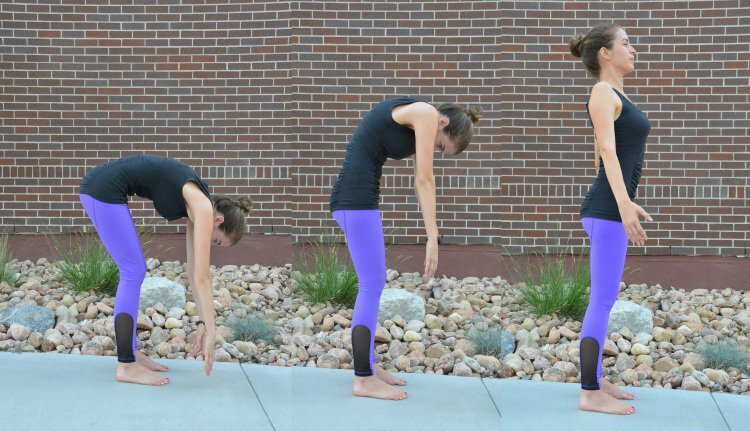 From a standing forward fold, try bending the knees a little bit or quite a bit. Find the amount of bend in your knees that reduces pull in the back of your body. Bring the hands to your hips. Engage your core underneath your hands (we are aiming to particularly activate the transverse abdominals, aka the “anatomical corset” and the pelvic floor). This should also help bring the spine into neutral, meaning that the low back is slightly curved into its natural position. Keep your spine long (and feel free to bend the knees more if needed) as you inhale to lift up to standing, leading with the back of your head. How does this feel? Let me know below or feel free to ask any questions.